The transmitter listed in the shopping list is a 1.5 watt transmitter. If you read the reviews, you will see it "burned up within 15 min". You MUST create a heatsink and have a fan blowing cool air over it or else IT WILL BURN. Mine even gets warm with the heatsink, but it is never too hot to touch. Now I will upload pictures and explain what I did. This project was as DIY as I could possibly make it. First, install the metal upgrade kit for the RC car's main drive shaft. This -WILL- break eventually if you use the plastic one at high speeds. I broke mine originally. The 9 volt battery to power the heatsink fan for the TX will fit nicely on top of the RC car battery. Once again, I made my power brick for the RX and goggles DIY. I used an old 12V router adapter. Connections for the goggles and the RX. 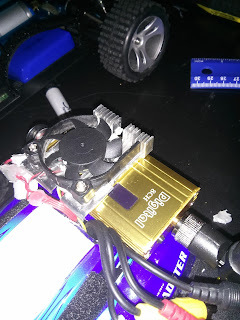 This is a post with the shopping list of parts I used to create my semi-long range FPV rc car. It will be a 2 part tutorial-ish thing with this post being the shopping list and notes about the purchased items. In the next post, I will include pictures and more info on how I set it up. NOTE: This is the -MAX- price for the least expensive stuff for -NON PRIME MEMBERS-. If you have amazon prime, or want to exclude any of these items because you already have them, the price will be lower. In my opinion, all the items in the cart below are required to use this setup to the fullest.